Alliance for the Great Lakes President and CEO Joel Brammeier was joined by Molly Flanagan, Vice President for Policy, and Crystal Davis, Policy Director, for a briefing on Great Lakes policy news on Friday, March 31st. In a lunchtime webinar, the Alliance team offered critical updates on Great Lakes federal policy, the Alliance’s strategy for protecting the lakes in 2017, and how to get involved. In case you missed it, you can access a recording of the webinar here — and check out the recap below! The Great Lakes continue to be a unifier and rallying point for the region — one with a long history of bipartisan successes. Elected officials, organizations, and community members from across the political spectrum have come together time and again to win critical restoration programs and protections, including the Great Lakes Compact, which ensures that our water will stay in the basin. But the Great Lakes are at risk. The White House’s proposed budget, along with some bad bills in Congress, threaten to roll back decades of progress. From invasive species, to toxic algae, to barriers to accessing safe and affordable drinking water — protecting the Great Lakes for all of our region’s communities is no small task. The time to act is now. The people of our region have the power to push back on threats to the Great Lakes. We have strong allies in Congress and no shortage of passionate advocates. Now here’s what you need to know. The bad: The proposed budget from the White House would eliminate the Great Lakes Restoration Initiative — from $300 million annually to $0 — and includes major cuts to EPA and other agencies that protect the Great Lakes. The good: The Great Lakes Congressional delegation is unhappy with the proposal and is united in fighting these cuts. The White House proposes a budget, but Congress holds the purse strings and your voice matters! The bad: There are a couple of bad bills in the House and Senate that would weaken protections against new invasive species. Additionally, the White House stopped the release of a recent study by the Army Corps of Engineers that would have detailed protections against Asian carp. The good: The Great Lakes Congressional delegation and a number of states are actively working to get the study released, the first step in constructing Asian carp control measures. There hasn’t been any movement so far, but we’re watching closely. On the legislative front, states are pushing back on efforts to weaken invasive species protections. The bad: The American Society of Civil Engineers gave the U.S. a D for its drinking water infrastructure and a D+ for its wastewater infrastructure. Most of this infrastructure around the Great Lakes region — and the country — is reaching the end of its useful life. More funding is needed at the federal, state and local levels. The good: Communities around the Great Lakes region are in agreement that additional funding makes sense. The big, unanswered questions are where this funding is going to come from and how it will be spent locally. This is complicated because we must ensure that everyone access to safe, clean drinking water and that low-income communities are not overburdened by the cost. We’re going to keep listening to local communities and talking with Congress to try to help figure this out. Your voice matters. 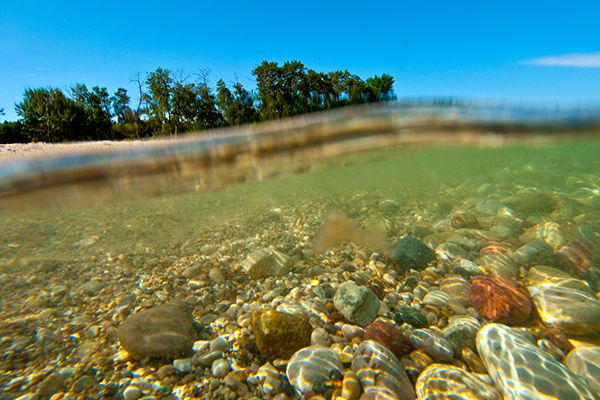 Several weeks ago we asked our supporters, “Why are the Great Lakes worth protecting?” And the response was incredible. In fact, we took your message to Congress—and they loved it. Offices told us that they were going to use your quotes and stories to make the case for continued support of the Great Lakes Restoration Initiative. They plan to share your thoughts with their colleagues in Congress to build support across the country for this important funding. We have their attention. Now here’s what you can do. Visit our Great Lakes Action Center to send a letter to Congress! Be sure to sign up for our email list to stay tuned, receive action alerts and other important Great updates. Do you love the Great Lakes? Sign up and we'll keep you up-to-date on critical Great Lakes issues and all the ways you can help.